It’s the name – even now, seventy years later – that jumps out at any rock fan worth their dusty record collection. Though the period of rock ‘n’ roll in question, the late 1940’s, has been consistently given the short shrift historically, if not altogether excluded from the discussion, the one name that has managed to withstand at least some of that generational neglect and remain vaguely recognizable to most with even just a passing interest in rock’s story is Wynonie Harris. And so it is we meet, officially, the man who would soon become rock’s biggest star, providing the definitive prototype for the role of a rock frontman which endures to this day. The swaggering, dashingly handsome, arrogant hell-raiser with a voice to match. If rock ‘n’ roll’s musical founder is Roy Brown, its spiritual standard bearer is undoubtedly Wynonie Harris. But as we’ll see, it nearly wasn’t so. Wynonie Harris was by no means an unknown when rock itself began in mid-1947. Like many who we’ll be encountering over the next few months as the style begins to take hold he was already an established artist with some notable successes behind him. Born in Omaha, Nebraska to an under-aged mother and never knowing his father, whose part-American Indian heritage was vaguely apparent in his offspring’s facial features, Wynonie was a cocky youth with a predilection for bawdy humor, sexual exploits and a flair for showmanship. Whether as a dancer, which earned him his initial notice around town in his teens, or when he stepped to the microphone and began singing at clubs soon after, Harris drew considerable attention to himself whatever he did. Feeling Nebraska was too small for someone of his talents he moved to California in 1940 where he quickly made a name for himself at the Club Alabam in Watts, at the time one of the hottest black-oriented venues in the city where even daring whites had ventured before the war for kicks and to get down on the musical vibes they were readily dishing out. It would’ve been impossible not to take notice of Harris at this point for he was already shaping up to be the prototypical leather-lunged shouter, perhaps with little variance in his delivery but with enough bravado and leering undertones to overcome whatever technical deficiencies he may have, while his lady-killer looks and growing off-stage reputation only added to the allure. Once established there he started touring regionally, further building his reputation as a dynamic performer as he began looking for an even bigger opportunity to help launch his career. In early 1944 he found it when he landed in Chicago and drew the notice of Lucky Millinder, one of the pre-eminent black bandleaders of the time with an unmatched eye for spotting raw talent who promptly signed the mercurial Harris on as a vocalist. When Harris joined Millinder the band was headed for their next stop in New York City where right away Wynonie would find himself playing the biggest theaters (The Savoy) and the hottest venues (The Apollo in Harlem), with a band that was tighter and more accomplished than any he’d been with before. 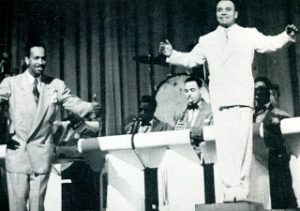 Millinder had a song for Wynonie to lead that was right up his alley, the ribald proto-rocker Who Threw The Whiskey In The Well, and Harris brought the house down with it from the moment they debuted it on stage in early April 1944. At the end of May they went into the studio to cut it for Decca but the label seemed in no rush to release it for some reason, choosing instead to issue Harris singing on Hurry Hurry, which managed to stir some mild action, though it wasn’t an official hit. But the responses he was getting with “Whiskey” at the shows made it clear – to Harris anyway, if no one else – that he was a budding star and by the time the tour reached Texas he was already demanding more money. Millinder refused, Harris quit, just four months after he started with Lucky, and went out on his own. It’s difficult to imagine what would’ve become of Harris if this impetuous decision had knocked him back down the entertainment ladder and simply led him back to the same old haunts he’d left behind, returning with his tail between his legs rather than a conquering hero after finding he’d overrated his own importance. After all, Millinder’s band was the one with the sturdy national reputation, Harris may have been getting good acclaim with them but was he actually known under his own name by those who had come to see Lucky and whomever was fronting his outfit that night? Name recognition, certainly at this point in time, was fleeting for someone without either a string of hits or years of successful touring behind him. For the first of many times in the life story of Wynonie Harris fate intervened on his behalf as the next spring, almost a year after cutting it, Who Threw The Whiskey In The Well was finally released by Decca (who apparently could care less that Harris was no longer with Millinder) and promptly became a #1 hit in the spring of 1945. The record itself was sort of rock ‘n’ roll in the zygote stage, a ribald tale of a church service turned into a drunken party thanks to some booze smuggled in by a wayward deacon, replete with call and response vocals and a handclapped backbeat to propel the song along. Though somewhat tame even by the standards of the dawn of rock we’re covering now, for 1945 it was definitely ahead of its time, a harbinger of things to come. Even without that knowledge of the changes looming down the road the song was huge with audiences and the focal point was Harris’s lusty raw-voiced shouting, establishing his salacious reputation on a national stage at last. Harris now had a résumé to match his own lofty opinion of himself. His stature remained high following this breakthrough, his brash on-stage persona was now becoming quite well-known, which certainly helped his drawing power on the road where he was now being billed as a star and he made sure to live like one besides, but despite this success he was something of a musical vagabond when it came to his recording career. In the years following his brief stint with Millinder he cut sides for a wide array of labels, all of whom must’ve been glad to have someone with his proven track record, yet despite notching two more small hits in the months to follow he stayed with most companies for just a lone session before leaving for another down the road. Furthermore, with each stop the quality of the records dropped off noticeably and were met with less and less interest commercially as time went on. And so it’s here where we pick up his story, back in L.A. where he began, trying to prove himself as something more than just a high-profile journeyman and to recapture his place amongst the elite artists in the black music community, which unbeknownst to him or anyone else at the time was a world about to be turned upside down. When on tour in New Orleans in June, 1947 Harris was approached by Roy Brown who offered him a song he’d written and had been performing to great acclaim locally for a year, Good Rocking Tonight. As detailed in that review, Harris turned him down flat, thinking himself too much of a star to even bother to consider such an offer from an unknown. Though no one knew it at the time it was the intersection of two careers on which the fate of modern music hung precariously in the balance. It was funny in a way because Harris had been Brown’s idol ever since Roy had seen him on stage with Millinder in Texas back in the summer of 1944, right before he quit (in fact, it may well have been Harris’s final show with Lucky), a time when Wynonie was a rapidly rising star. Now almost three years later Harris’s star was falling fast and he was too blind to see the song that would be his ultimate salvation staring him in the face. 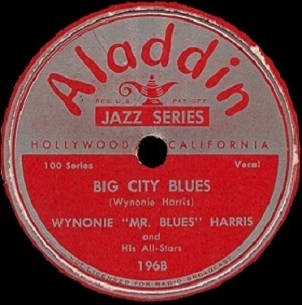 A month later, ironically at the same time Brown was laying down that fateful song himself in New Orleans launching both his own career and rock ‘n’ roll itself into orbit, Harris was in an L.A. studio cutting a session for Aladdin and if Big City Blues is any indication it may very well have marked the beginning of the end for him as a viable recording artist. The song is uninspiring at best, an utter waste of time at worse. Slow, tedious and if not completely out of date in the bigger musical picture of 1947, in the infant’s cradle of rock ‘n’ roll it was already anachronistic. In fact we’re not including it here because of what it contains as much as what it represents: A rock artist who has yet to discover he’s a rock artist, spinning his wheels and sinking deeper into the mud while at the same time the fickle hand of fate is once again poised to pull him out of the morass and revive his career while fully establishing the genre that transformed everything in no short order. But listening to this you’d never know it as it’s without question the worst record Harris had recorded to date (well, not entirely true, the flip is even worse!). Though the storyline of Big City Blues is somewhat autobiographical there’s no sign of any personal investment on Harris’s behalf. The arrangement is outdated, not entirely Wynonie’s fault maybe but an indication that a lot of the black music community were unsure of where to go and were just lurching around in the dark until rock’s arrival revitalized the entire scene. But even in the pre-rock landscape the song still wouldn’t cut it, the whole thing comes off as flat and listless no matter what standards are used. The horns are excessively brassy and lacking guts, sounding as if they’re introducing a fourth rate comedian in a half empty gin joint on the outskirts of town. The melody that follows is tired, like a music box winding down rather than doing anything to energize the listener. Even the horn solo in the first break just goes through the motions, adding nothing of value, just taking up space so the others can catch a snooze. It’s music by the numbers, the band, the producer and the singer all coming off as completely uninspired, simply cashing a paycheck while they still have the chance to since after turning in such a listless performance here their opportunities to do so in the future are sure to dwindle. Harris’s approach vocally hasn’t changed from when he sounded so fresh and vibrant with Millinder, in fact his approach would NEVER drastically change, but it’s at odds with everything around it here. He dutifully goes through his rather limited repertoire of vocal stunts, bearing down on certain syllables and trying unsuccessfully to convince you of his urgency, but there’s no meat on the bones. The lyrics don’t lead anywhere either to get us involved that way, it’s a postcard rather than a letter, a vignette that offers no details and thus stirs no interest. What’s even more damning though – beyond the construction of the song itself – is Harris’s rather apathetic performance. His enthusiasm is forced and half-hearted and considering enthusiasm is the biggest natural attribute Wynonie Harris possesses, that ability to convince you that he’s charged up and raring to go at all times, a fast-living, hard-drinking, unquenchable sexual dynamo, the Energizer Bunny on steroids decades before either of those references were even feasible, it’s shaping up to be a sad epitaph in career that once looked so promising. It’s not a stretch to say that Wynonie Harris, who’d go on to be one of the most important musical figures of the 20th Century, would’ve been nothing more than a washed-up one hit wonder (three hit wonder?) long forgotten had rock ‘n’ roll not been born at the exact point when his own career was about to sink quietly into the abyss. It didn’t turn out that way of course but at this juncture nobody, least of all Harris himself, could’ve predicted the turn of events just getting underway that would change everything in the blink of an eye. Certainly Wynonie himself was out of inspiration if nothing else and lackluster efforts like Big City Blues were simply random shots in the dark, hoping beyond hope that something might catch on, but if by chance it did they’d be damned if any of them knew why. That’s not any way to approach a recording session and not surprisingly with such meager results to show for these efforts Aladdin didn’t renew his contract in October when it expired. Oddly enough that would be the best thing that could’ve happened to him, although for a brief time it looked as if Wynonie Harris, the man who was destined to become rock’s first undisputed star, would almost have his story in rock music end before it even really began. Leave a reply on "Wynonie Harris: “Big City Blues”"